For Your Small Japanese Garden by YUKIMONO: What type of pot should NOT be chosen for a bonsai beginner? What type of pot should NOT be chosen for a bonsai beginner? When I took part in a bonsai workshop for the first time, I put some plants in a small pot offered by the bonsai teacher. It was a round bonsai pot with a thin mouth, white glaze, and the size of just a tea cup. Though the pot was very simple, it beautifully matched the plants. Come to think of it, the teacher definitely chose the perfect pot for us, bonsai beginners, so that we could become interested in bonsai. I remember that my first bonsai pot was like this. 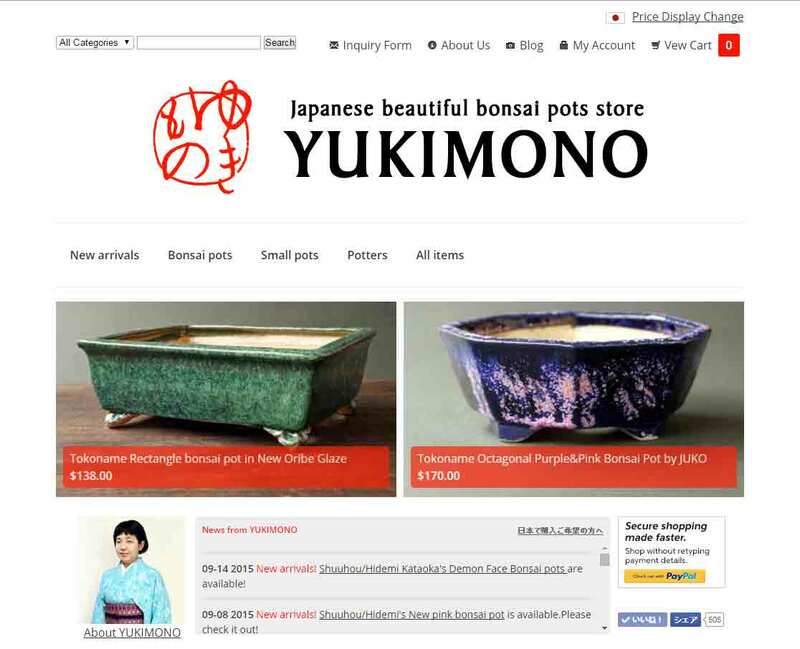 I would like to write about what bonsai pot would be good for the first time, however, it is too difficult to me, so I will tell you what type of pot should NOT be chosen for a beginner. 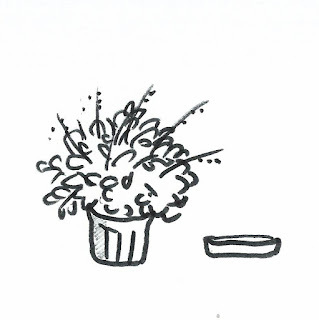 I suppose many people have the image that Bonsai is just made of a dwarf tree and a small pot, and beginners tend to push a plant that they just got from a gardening store, into a very small or shallow pot. I understand this because I have done it before (and sometimes still do it), however it is wrong. 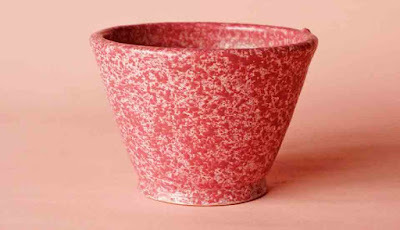 It is better to choose a pot with a little depth, to keep a plant in it for at least 1~2 years. 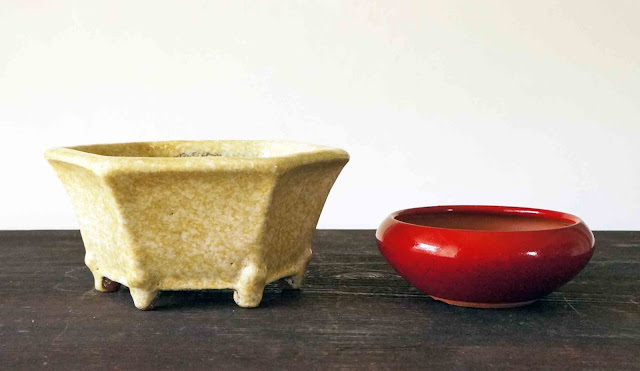 The lotus-shaped pot, the crescent-shaped pot, the pot with the demon face, the pot with the cloud feet or the cat feet…...there are many cool bonsai pots and you might want to take one of them in your hand for the first time. But it is dangerous. The pot has a front and a back as well as a plant for bonsai. It is therefore highly difficult to balance both the pot and the plant with the front and back, and also find the best combination of them. For the first time, you don’t need to spend much money on a bonsai pot, however, you should avoid a poor pot or a pot that isn’t suitable for growing plants as follows. ・It doesn’t have any drainage holes. Hopefully you wouldn’t substitute your favorite used coffee cup for a bonsai pot! ・It is cracked and easily broken. ・It is dirty and mold grows. Yes, I know a pot on which a picture is drawn with some colors is so pretty that you might want to pick it up as a special pot for celebrating the first time bonsai. But I don’t recommend it and the reason is similar to No.2. It is quite difficult to suitably match a pot drawn a picture on with plants. You must think about not only the shapes and sizes, but also the colors of the combination with the pot and the plants. So I think you should avoid such a situation for the first time doing bonsai. All these examples I have written about come from personal experience, I have learned through my failures. Sometimes I still make mistakes when I choose a pot. Please take a look at the pots below, they are not too small, not too shallow, simple and beautiful. I think these pots are good for bonsai beginners. Above all however, the most important thing is to enjoy bonsai with the pot that you really like. 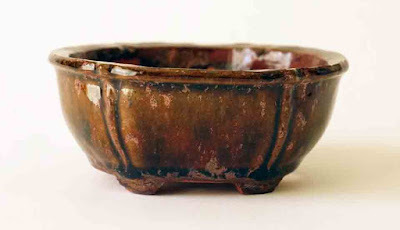 So, don’t hesitate trying with your favorite pot and have a fun in the wonderful world of bonsai pots as I do! 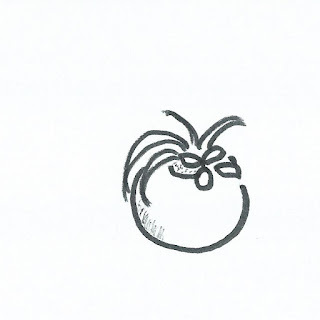 Thank you very much for reading YUKIMONO post till the end!